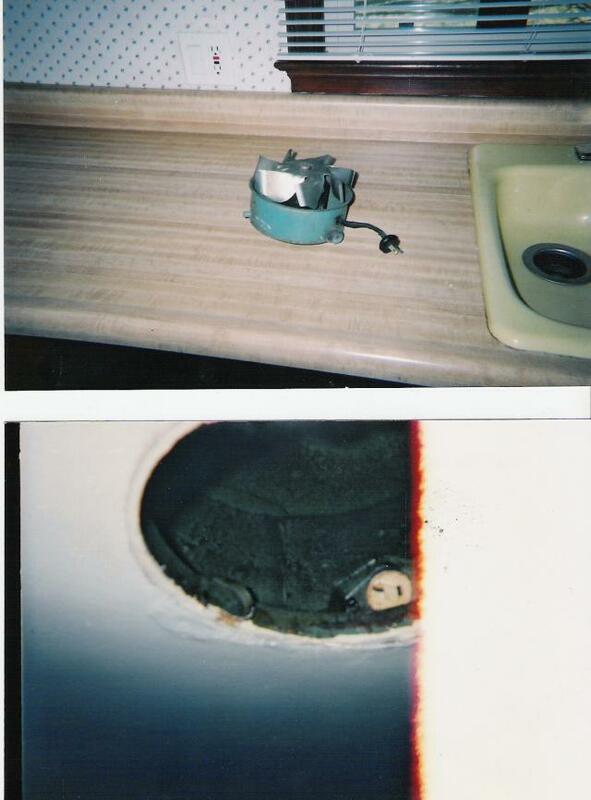 Here are two pics of an old -probably about 1940- range exhaust fan. Unlike current models, this one monted inside the duct, and plugged into an unusual receptacle. It ran on 110. I believe that the same pattern was shown on this site as a receptacle for TV antennaes. I don't doubt that one bit- consider this pic a reminder to never assume, and that NEMA patterns haven't been with us all that long! Was this all factory original or probably a hack-job cobbled together by someone many decades ago? Looking at the picture of the duct & receptacle, it looks like someone just stuck whatever recept they had on hand. No, Sven, as best I could tell, the fan was manufactured along with the piece of duct that held it in place. Interesting old fan. What brand? Does it still work or did it burn out? Noisy? I've seen similar in 50s/60s homes around here in wall or ceiling before range hoods became popular. Is that duct tape around the socket? The fan technically worked, more or less. Sometimes it would start, other times it would just hum. It has since been replaced. No, that is not duct tape. Rather, it is part of a sheet-metal flange that held the socket in place. Did you re-attach the existing cord-cap and socket? No, the replacement fan was of the more conventional squirrel-cage type. I ran the old K&T to a junction box, with a short whip of Romex from there to the fan. As you might guess, this job involved a lot more carpentry and plaster work than electrical work! Wonder why it would just hum sometimes? Good that you replaced it anyway. Wonder why it would just hum sometimes? Because it didn't know the whole song...LMAO...sorry, couldn't resist.